I like taking pictures of older things that have been left to decay by the society they once served. 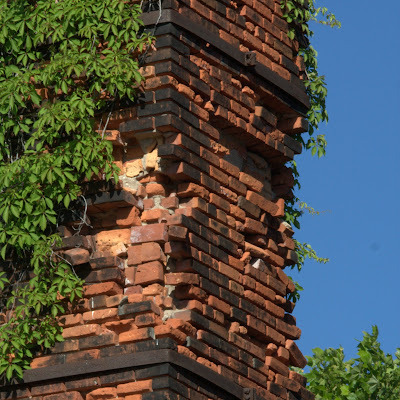 This is part of an old chimney on a warehouse adjacent to the Lambert's Point RR tracks on Princess Anne Road in Norfolk, Virginia. The bricks are lose and falling away, the iron bands placed years ago to add life are failing and the vines are working slowly on nature's reclamation. It's only a matter of time. Canon 40D, 173mm, 1/100 sec @ f/18.0, ISO 100. This is probably my favorite pic on the page right now. Reminds me of Europe where there are lots of old crumbling buildings...not like Florida where everything is new and shiny and surrounded by palm trees! LOL! This area is nice for history buffs. Nothing like Europe but there are a lot of structures from the past 350 years. Preservation is more in vogue now although we still see many old buildings torn down.